Amazon’s Kindle product line, which expanded with three new models Wednesday, has come a long way since it was first introduced in 2007. 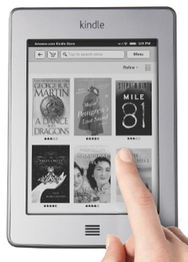 For the fourth generation of Kindle, Amazon’s fragmented the Kindle product line even further. There’s the fourth-generation Kindle itself, the new Kindle Touch, and of course the full-color Kindle Fire. If you’re in the market for an ebook reader, choosing among Kindle options has never been more confusing. Let’s start with the Kindle’s namesake. Like previous Kindles, it’s powered by a grayscale E-Ink screen that looks great in sunlight and requires lighting at night. This little guy is the cheapest Kindle yet, but the trade-off is that it’s got no touchscreen. 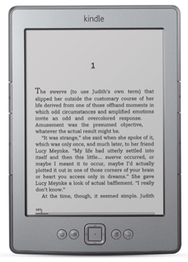 As with previous-generation Kindles, you move forward and back through the pages of your book via buttons on the left and right side of the device. Four other buttons and a directional square sit just below the screen, and you presumably use these buttons to navigate through the rest of the Kindle interface. Since the keyboard of old Kindles has vanished, you’ll need to do any typing through the laborious use of a “ouija board” keyboard, guided by the directional square. If that sounds painful, well, yeah, it’s painful. But I’d wager that most Kindle users do very little work with the keyboard, which is why I’m excited that Amazon decided to dump it. I will occasionally highlight a passage and leave a note, but it’s rare. I basically only use the keyboard to enter in wi-fi passwords, and I can manage that from the ouija board. If you do type a lot on your Kindle, the new fourth-generation Kindle isn’t for you. (The fourth-generation Kindle only supports Wi-Fi networking, so if you’re a big traveler who is often without nearby Wi-Fi, it’s also not for you.) But starting at $79, I suspect, will make it the right Kindle for a whole lot of people who are curious about the ebook thing. It sounds kind of chintzy, embedding ads in a product like this. And that’s why Amazon will let you pay $109 for a fourth-generation Kindle without Special Offers. However, I’ve talked to some people with the Special Offers Kindle who say that the ads are more of a feature than a liability. I’ve heard of good deals on Amazon merchandise, and even gift-card deals such as $20 Amazon credit for $10. If you have a stomach for a little marketing and enjoy getting deals on Amazon.com goods, the Special Offers Kindle might be an even better deal than it appears to be. To turn pages with the Kindle Touch, you just touch the screen. The bulk of the screen turns the page forward; a narrow strip on the left side turns it backward, and a tap at the very top brings up a toolbar. If you need to type, you bring up a software keyboard and tap on the keys as you would on an iPhone or iPad. It all sounds quite civilized, and I’d expect that the Kindle Touch will eventually spell the death of the classic buttony Kindle. But if you don’t do a lot of text entry on your Kindle, I’m not sure just how crucial that touch interface is to the enjoyment of books. Clicking the next button works pretty well. I don’t have to move my finger to tap on the screen (and get my finger grease on that screen). I admit that in the long run using a square of directional buttons to navigate around will feel about as modern as stone knives and bear skins. Yet I find myself wondering if I might actually prefer the fourth-generation Kindle to the touchscreen model—it’s a bit smaller and lighter than the Kindle Touch. I guess I’ll have to try the Kindle Touch’s touchscreen out to see just how it works in real life. The pricing of the Kindle Touch is more complicated than the fourth-generation model, because it comes in both Wi-Fi and Wi-Fi/3G versions, with and without Special Offers. The Wi-Fi-only version will cost $99 with Special Offers or $139 without; the Wi-Fi/3G version (which offers 3G cellular-data connectivity to the Internet without any data charges, ever—still a pretty good deal) costs $149 with Special Offers, $189 without. At the top of the line—and only $10 more than the 3G/Wi-Fi Kindle Touch without Special Offers!—is the $199 Kindle Fire. 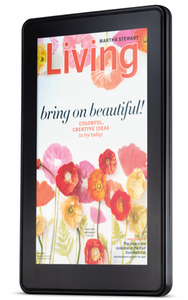 This is the big one, a seven-inch backlit color touchscreen. (No need for a clip-on Kindle book light!) It’s unlike any other Kindle (and more akin to the archenemy $249 Nook Color). Though it’s based on Google’s Android operating system, it’s not meant to be Yet Another Android Tablet. Indeed, the Kindle Fire doesn’t contain any Google apps, so far as we can tell. Instead, Amazon’s built its own interface, tied into not just the Kindle Store, but the rest of the Amazon ecosystem: Amazon’s Appstore, MP3 music store, and video store. The Kindle Fire is a media-consumption device that goes way beyond book reading. Though you can read books on the Kindle Fire, it’s meant for web browsing, videos, music, and apps—especially games. As always, the devil is in the details, but the Kindle Fire looks primed to rapidly become the first successful tablet product not made by Apple. So is the Kindle Fire an iPad competitor? It certainly seems to fit right between the iPod touch and the iPad. When Apple launched the iPad it made a big deal about it being capable of running iWork apps, about not being just a content-consumption device. The Kindle Fire is unabashedly a content-consumption device. And it looks like it might be a pretty good one. It’s also hard to see how other Android-based tablets will compete with the Kindle Fire, which comes pre-wired with an entire entertainment ecosystem for a remarkably low price. To get the Kindle Fire to be priced at $199, Amazon has definitely made some compromises. It has no cameras, for instance, and only Wi-Fi networking. I’m not sure if most people will care. However, let’s also remember that the Kindle Fire is a 1.0 product. It’s Amazon’s very first attempt to build an Android-based backlit color-LCD device. There are bound to be bugs and quirks and, who knows, there are even rumors that this is a stopgap product to get Amazon through the holidays. If you picture a giftwrapped Kindle in your holiday plans, you’ll need to get in line soon. I imagine Amazon will rapidly sell out for the holidays. As always, which device you should buy depends on how you’ll use it. If you’ve already got an iPad, I’m not sure the Kindle Fire makes sense. The iPad already lets you read Kindle books, visit websites, rent videos, and the rest. If you haven’t bought an iPad, though, it looks compelling, but I’m a little concerned that the first-generation model is going to have some rough edges. Buyer beware. I’ve got an iPad and a Kindle, though. I love my iPad, but I prefer reading books (and even my morning newspaper) on the light, small Kindle with its e-ink display. Personally, I’m torn between the fourth-generation Kindle and the Kindle Touch. If you are a current Kindle user who uses the physical keyboard a lot (or if you’re a non-Kindle user who anticipates taking lots of notes on the books you read), you should buy the Kindle Touch. If you don’t expect to use the keyboard, the adjectiveless Kindle is probably just fine. If you’re like Cayce Pollard and allergic to branding, you should pay the extra dough to avoid the Special Offers models; if you’re a deal-finder, you might prefer to save cash and then take advantage of those selfsame offers. If you want a new Kindle for the holidays you may have to take your best guess, order one, and see what happens. If you’re not satisfied, at least Amazon will let you return it for a refund—a policy I took advantage of way back in December of 2007. The Kindle’s sure come a long way since then. If you're already committed to Amazon but don't use any of the audio book features, this fourth-generation Kindle is a worthwhile upgrade over the third-generation Kindle for its featherlight weight and performance enhancements. Though the Kindle Touch brings Amazon up to speed with other e-readers, its hardware and software offer little in the way of imagination and useful innovation.